Dan Gilbert might want to divest of gaming investments in order to buy the Detroit Tigers. Jack Casino owner Dan Gilbert is considering selling his casinos in Detroit, Cleveland, and Cincinnati. Dan Gilbert is the Detroit native who owns Quicken Loans and the Cleveland Cavaliers. He also has interests in racetracks. At one time, Dan Gilbert was partners with Caesars Entertainment in the Horseshoe Casinos in Cleveland and Cincinnati. Later, he took full control of those casinos and rebranded them as JACK Casinos. Gilbert’s casinos are underperforming against their competition. Greektown Casino has the lowest win among Detroit’s casinos, while the two Ohio-based Jack Casinos are the lowest-performing in their states. The Hollywood Casinos in Toledo and Columbus generate more revenue than their Jack Casino counterparts. The Columbus metropolitan area (1.9 million) has a comparable population size to the Cleveland (2.1 million) and Cincinnati (2.05 million) areas, but the Toledo metropolitan area (680k) is much smaller in terms of overall population. 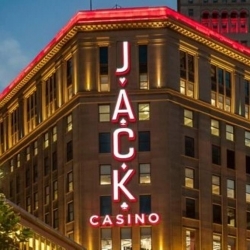 Caesars Entertainment is a potential buyer of the various Jack Casino operations, due to their previous ties to the area and prior business relationship with Dan Gilbert. Caesars still has a database of potential customers for the Cleveland, Cincinnati, and Detroit areas. Caesars owns a casino across the Ambassador Bridge between Detroit and Windsor, Ontario — the Caesars Windsor Hotel & Casino. It is unknown what the 7-mile proximity between Caesars Windsor and Greektown Casino would mean to a potential sale, though Caesars owns three casinos within a short drive of one another in Atlantic City, New Jersey. Eldorado Entertainment currently is in the process of buying Tropicana Casino in Atlantic City from Carl Icahn. Roger Gros said Eldorado is only one of several companies which might be interested. Some speculate that Dan Gilbert wants to buy the Detroit Tigers, his hometown ballclub. While the Cleveland Cavaliers always was a business proposition to the Quicken Loans founder, those close to Dan Gilbert say he always has wanted to own the Detroit Tigers. There has been speculation Gilbert might want to buy an NFL franchise, too. In either case, Dan Gilbert would have to divest himself of his casino interests in order to join Major League Baseball or the National Football League. Both the NFL and MLB do not allow owners to hold interest in gaming operations, though the NBA has no such restrictions. Dan Gilbert wants to divest at a time when the United States casino market should be seeing an increase in revenue, due to the legalization of sports betting at the federal level. It is estimated the US legal sports betting market could top $6 billion by the year 2023, if 30 US states legalize bookmaker operations in their jurisdiction. That is considered a realistic possibility, though only 6 US states currently has legal sports betting of any kind. Pennsylvania and Rhode Island are expected to legalize sports betting this year, while New York, Michigan, West Virginia, and Illinois have discussed the possibility. Massachusetts and Connecticut each remain outside possibilities in the next 2 to 3 years. Offshore online sportsbooks represent a multi-billion dollar industry. If the US sportsbook market legalizes in the next few years, it could undermine the revenue potential of the online bookies, though the full potential impact remains unknown. The impact could be less than one suspects. Unlicensed bookmakers can offer better odds than their licensed counterparts, because they are not taxed. That does not always mean a bookie offers better betting lines, but in a more competitive market, they might. Legal and regulated land-based sportsbooks are more reliable and trustworthy, due to the many consumer protection and responsible gaming laws involved. Of course, the same could be said about gas sales’ impact on convenience stores. Those in the business say most convenience stores make little money from the sale of gasoline, because it’s expensive and has little markup. What gasoline does is draw customers to the store, where they buy whatever is inside the convenience store. A sportsbook works on the same principle. Sports bettors go inside to wager on their favorite ball team. They remain inside to wager on the slots, at the blackjack table, or in the poker room. And like Roger Gros noted, they buy food and drink while inside.